Food systems are either sources of nourishment forging the foundations of human health and well-being or one of the most substantial health risk factors. An entire colonization of the earth, agriculture and our bodies has taken place over a century. Food and agriculture systems upon which we all depend have increasingly become industrialized and globalized. Commercial compulsions of current global agricultural and food systems, compounded by high levels of economic inequality are making healthy diets unavailable or unaffordable to large sections of the population in every part of the world. The degradation of every dimension of the food chain, from soil, water and seeds to production and processing and distribution, involve, above all, the abandonment of natural, organic and traditional diets, which have been the foundation of human health throughout the world in most of known human history. Traditional diets, such as the Mediterranean or Ayurvedic diets, are characterized by determined protective properties, and tend to be more diverse than western standardized diets, as well as supported by local, agrobiodiverse and agroecological food systems, which regenerate the health of ecosystems and communities and work toward harmony with nature, food sovereignty and seed resilience in the hands of farmers. Our traditional foods are our “breads of freedom”, based on biodiversity and the historical and cultural heritage of our communities. E.g. : corn and tortillas in Latin America, rice in Indonesia Japan and Bangladesh, banana and cassava across Africa, pasta in Italy, baked bread in many countries of Europe and hundreds of kinds of breads of India, to name a few. Under the pressure of the current industrial food and agriculture systems these are becoming “forgotten foods”, but they still are the expression of a value chain that works for nature and for the health and dignity of people. They come from the varieties of our indigenous grains and staples, from biodiverse poison-free agriculture, from artisanal processing. All over the world policies are being made and laws are being written to privilege corporate profits above people’s nourishment and health. As corporations hijack our seed, our agriculture, our food processing, our retail systems and local economies, they are destroying our livelihoods and the health of all citizens. Our breads of freedom are also affected by the release of specific GM crops in those parts of the world which are recognized as a centre of origin of those same crops, and the issue of germplasm contamination represents a threat to the future of biodiversity at a global level. Our right to livelihoods with dignity and freedom is connected to protecting our food heritage. Resisting all aspects of the globalization of our food systems and protecting our traditional diets and our breads of freedom by practicing and promoting sustainable and ecological models in agriculture, food economies and societies, are the most powerful means to regain our agriculture, our territories, our food, our natural environment, our future. In the reconquest of self-reliance lies the power that makes big corporations irrelevant and useless. The means to reconquer are in our hands: for the good of the earth, for our health, for our common goods. Our hope, our future is based on the reconstruction of this virtuous link between fields, tables and communities. Many of us across the world are engaged in growing food, processing food, providing food to their community and their families, as small farmers, as artisanal processors, as small and tiny retailers, as hawkers and street vendors, as mothers and all those serving their families and communities. Our Breads of Freedom represent our birth right to our livelihoods, to grow, process and eat the food we need. We have the responsibility to protect the food diversity that Mother Earth has made available to us. Our food legacy transmitted through generations is the myriad ways of processing and preparing food. We want to hear your voice! 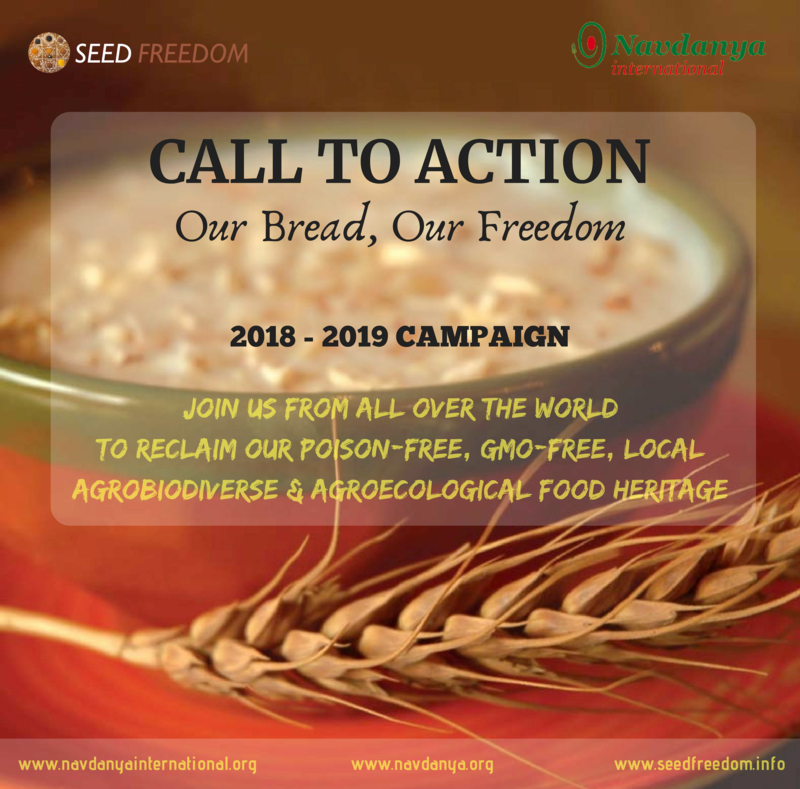 Join “Our Bread, Our Freedom” campaign as individual or organisation/group and contribute with recipes, stories, research, videos, photos, art, poetry, feel free to contact us through https://seedfreedom.info/contact-us/ and we will post it on our platforms. Organise a Breads of Freedom event, add it to our calendar https://seedfreedom.info/events/submit-your-event/ and we will share it. It can be a dinner, lunch or picnic with your family, friends, community or institution sourcing ingredients from farmers who are saving and using organic seeds (non GMO/non patented). Read and share Navdanya’s Food for Health Campaign‘s content to spread awareness and understanding on the links between living seed, living soil, living food, health, knowledge and sustainable living economies. 1. Food is not just to stop hunger. Food is for good health. 2. Our food today contains less nutrition. Artificial food meets corporate greed. Nutritious food is my need. 3. Our life styles demand more nutrition. Healthy nutrition. Natural nutrition. Our nutrition. 4. To eat healthy is our birthright. No more poisons, chemicals and GMOs in our food. 5. . We must grow our own nutrition and cultivate real food communities to cultivate health. 6. We will resist any laws that threatens our Food Sovereignty and diverse food culture. 5th October Vasundhara – Navdanya’s Gathering of Farmers, Navdanya Biodiversity Conservation Farm, Doon Valley, India.